Making a DIY Mirror Frame is easier than you think! 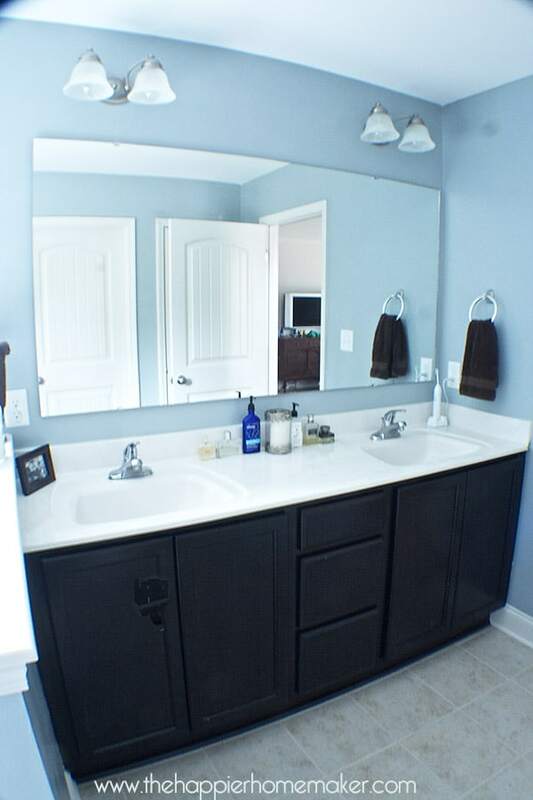 My husband and I have been hard at work transforming our master bathroom into the vision we had when we first built the house. I recently shared how we painted the room and put up a gorgeous custom roman shade from Blinds.com-it made a huge difference in the feel of the room but the next thing on our list was to frame out the mirror. 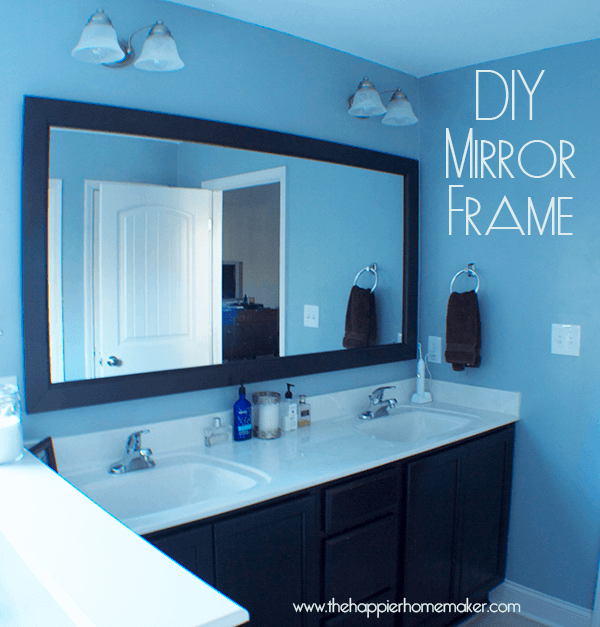 I love the look of wood framed bathroom mirrors and it was a very easy DIY! We wanted the molding to match the cabinets so we decided to try Oil Rubbed Bronze spray paint. 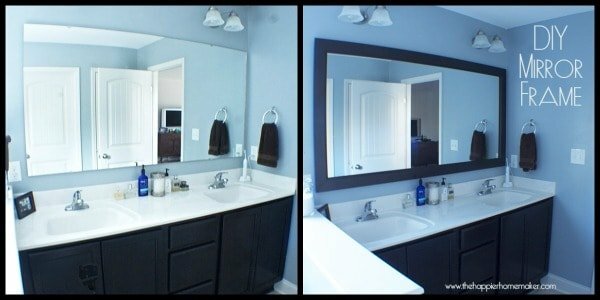 Be sure to paint both the back and front as you’ll see a little of the reflection of the back once you have your DIY mirror frame up. 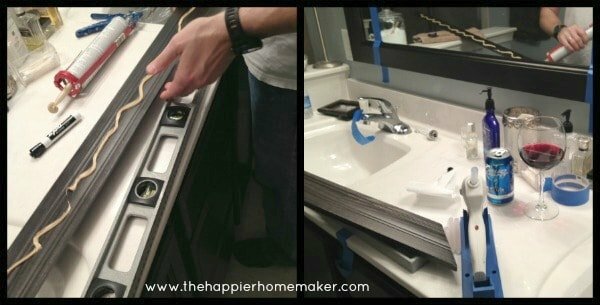 Once we had prepared the molding we were ready to put the DIY Mirror Frame up. We had mirror mastic as I had seen recommended on other blogs but it was not holding the frame at all. I tried to tape the frame in place as well but-nope-still wasn’t working. So I poured myself a glass of wine and got to googling! I found this tutorial from Rhoda over at Southern Hospitality (she’s fabulous by the way!) and grabbed my glue gun to help us out! The glue gun worked fabulously to hold the molding in place so the mastic could dry. My husband would apply the mastic to the back of the molding then I would quickly put hot glue at the corners and at intervals along the length (being careful to get neither too close to the edge) and he would put the molding up quickly before the hot glue dried while I grabbed the level to check it…we were like a well-oiled machine and once we figured it out we had the entire thing up in 15 minutes! We didn’t have to caulk the gaps but if your edges don’t match up perfectly you can apply paintable caulk and then paint it to match your molding. Here is the before and after, what a difference it made! I’m so glad we took the time to learn how to make a mirror frame!! Have you framed out any mirrors in your home? I was so nervous to do this and kept putting it off but it was really so easy and inexpensive and made a huge impact! The popularity of the UPVC doprs and windows is on the rise globally. A new door can exponentially increase your curb appeal and freshen up the look off your home. Many people may see dark paneling in their rooms as a curse. Question for you is how did you get around the brackets that hold up the mirror against the wall? How did you get you trim to sit flat against the mirror. My brackets were not very big Jason so I just had my molding go directly over them, you couldn’t really tell they were not totally flush, it just looked like a bit of a shadow at the edge. Hope that helps! looks awesome! question though. Did any of your glue show on the refelction in the mirror? I did this and you can see some of the glue (I guess we got too close to the edge). Any idea for a fix for that? I didn’t have the glue show through but the only thing I can think of to fix it would be to scrap it off with an Xacto knife or razor. Good luck! Can you do this project with a mirror that has a rounded/tapered or beveled edge? Thank you. By chance, does anyone know if you could apply the same GREAT method which was outlined in this blog post. Please HELP & respond ASAP!!! Thanks in advance for any help &/or assistance on this.